At Graymills, we recognize the need to combine the rugged dependability of our pumps with a variety of tank sizes and shapes, to provide a comprehensive line of fluid collection and recirculating systems. We know that these tank systems will see a lot of hard work and rough treatment during their long working lives. That’s why Graymills designs its tanks the way they should be built... like a tank. To prove our point, take a look at the cutaway below and notice the built-in durability and quality. Features, capabilities and materials differ from tank to tank, but each follows in the Graymills tradition of quality and dependability. We don’t believe in short- cuts that might compromise the quality of our products... or your satisfaction. And if you need a special, one-of-a-kind pumping system, we are ready to design and build one to meet your specific requirements. For more information on any of our products or help in ordering, call us or a member of our nationwide network of distributors. We’re ready to solve your pumping and fluid circulating problems. Durably constructed of cold rolled steel with a powder coated finish. Stainless tanks also available. 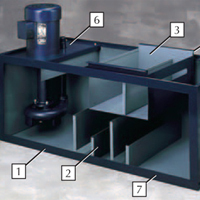 Tank systems larger than 5 gallons contain from one to four baffles, carefully sized and positioned to make solids settle out and keep circulated fluid clean. Depending on tank size and flow requirements, tanks larger than 5 gallons are equipped with either a wire mesh screen bowl or chip collection basket. On the coolant return, chip collection baskets have an extra baffle and a fluid return slot to further aid the settling process. Tank and collection basket edges are hemmed to eliminate exposed sharp edges and increase rigidity. For improved adhesion all exterior tank surfaces are cleaned with a phosphatized wash prior to powder coating. Lids are recessed to contain spills. To assure maximum strength and uniformity, tanks are jig and fixture assembled and spot welded prior to MIG seam welding. Every tank is then dye penetrant-tested for 24 hours. Not even a pinhole leak can slip past this procedure. As a result of these stringent procedures, each tank carries Graymills’ one year warranty. We also manufacture custom systems for unique applications and OEMs. The size versus performance ratio makes these easily adaptable to a variety of applications as an upgrade to a standard pumping system. Capable of handling very large or multiple machine installations along with many other applications where extra capacity is needed. 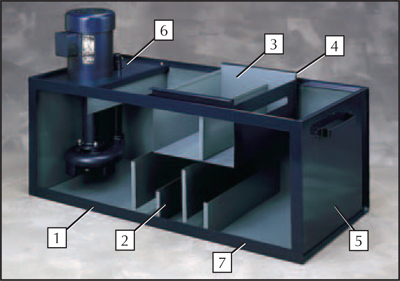 These systems are designed for a wide variety of liquids that require constant circulation to maintain uniform viscosity or contains solids which must be kept is suspension. These units combine the same durable features of our standard units with lower working heights, portability, and our economical IM Series Pumps.